This hat was knit over the course of an evening, while I was babysitting a friends kids. The pattern is by the yarn harlot and the chunky yarn was cheap crap from Lincraft. Perfect for a little girl who will probably loose it. It's cute, I love chunky, and look, it's a neutrals & neon thing! 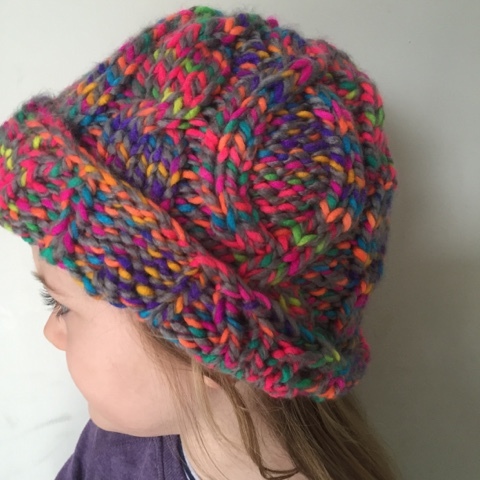 What just rushed through my head was > I'd love to knit my kids hats, my kids hate most yarns, itchy, I wonder if this would work in t-shirt yarn. God I love t-shirt yarn. I haven't knit with T-shirt yarn yet, I don't even have any in stash (I have, however ,watched a YouTube vid on how to make it). I may look into this and get back to you.